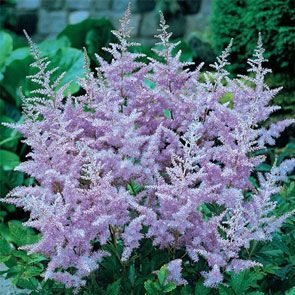 When professional landscapers create a plan for an elegant garden, they almost always reserve a spot for a special planting of astilbes. Few plants provide so much beauty and colour for such an extended period…and with so little care. These attractive, mound-shaped perennials with fernlike foliage produce dozens of soft, feathery, plumelike flowers on 20-36" stems. Astilbes grow well anywhere, but are particularly fond of shady spots where dramatic colour is often lacking. They're not fussy about soil and do especially well at watersides. Astilbes are attractive when planted in drifts or when used in combination with other perennials. Even a single specimen is effective since the foliage, blooms and shape of each plant can be appreciated from all sides. They offer a long blooming period during late spring and early summer, filling the garden with feathery spires for many weeks. Even when not in bloom, their dark green, high-gloss leaves are attractive all by themselves or as summer bouquet greenery. 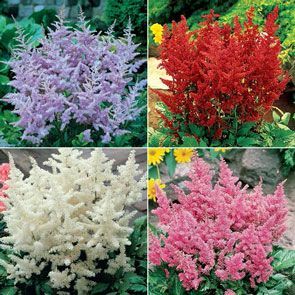 Now, you can enjoy a complete collection of the four most outstanding astilbe varieties at an extremely attractive price. Breck's ® has assembled a collection of prime-quality astilbes—each fully guaranteed to grow and bloom beautifully in your garden this spring and summer—and to bring continuing beauty for many years to come. 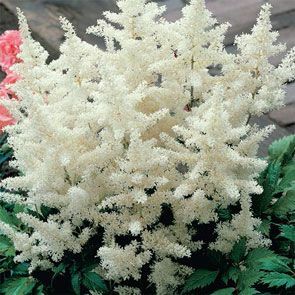 When astilbes were introduced into Europe from the Orient in the mid-nineteenth century, their beautiful flowering plumes reminded palace gardeners of popular spring-blooming spirea shrubs. Still to this day, in both Europe and America, they are often called Garden or Florists' Spirea. But with so many distinctive qualities, they deserve recognition by their own name. 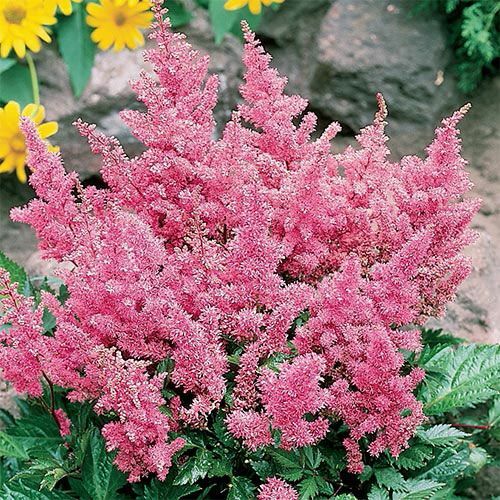 In Holland, astilbes have long been the mainstay of summer perennial gardens. They're so easy to grow and require so little attention, you'll even find them blooming brightly along roads and canals. Planted en masse, they're a special delight. While you'll find them blooming in sunny spots, they are most often chosen for their unique ability to grow with vigour and bloom profusely in shade or semi-shade. All they ask for is plenty of moisture to keep their roots thriving. While the 20-36" flowering stems bloom with colourful charm for several weeks in late spring and early summer, their beauty doesn't end when the colour fades. The dried plumes turn an elegant amber-tan and continue to provide garden charm all through the summer and into the fall. Meanwhile, the high-gloss, dark green foliage, which grows in foot-high mounds, provides an extremely attractive ground cover. There are many varieties of astilbe, but the finest of all for American gardens are the four varieties specially selected for Breck's ® Deluxe Astilbe Collection. Lavender: Gorgeous feathery plumes in lovely lavender are a rare sight to see! Mounds of lush foliage sets the stage for an amazing pop of colour that draws in the eye. 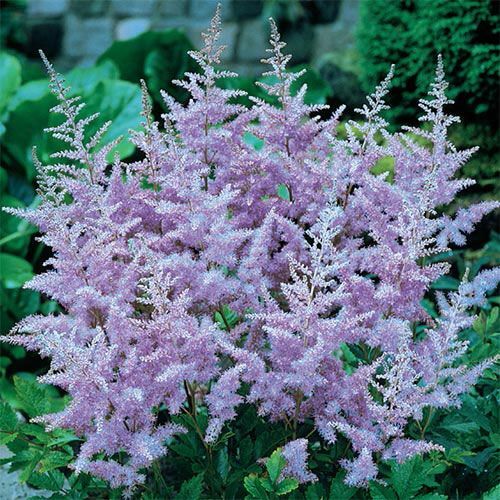 The cool hue completes the look of an astilbe garden, and adds a unique element to any flower bed. Red Fanal: An absolute must for any astilbe planting. 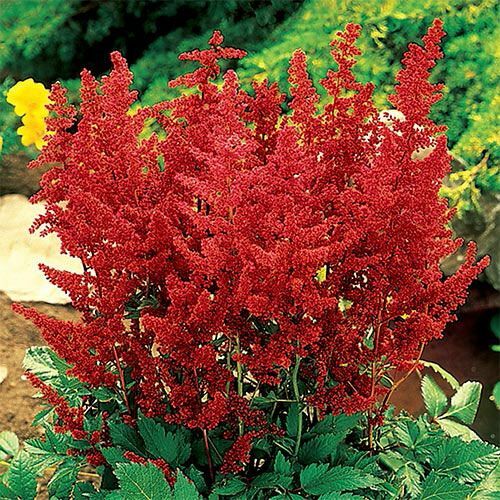 Scarlet plumes will truly stand out in your flower garden with its deep rich colour. Each contain hundreds of florets that create eye-popping beauty wherever they are planted. Deutschland: Deutschland's big, feathery, snow white plumes create garden excitement as they stand proudly above the elegant, deep green mounds of foliage. The ideal plant to blend with other perennials as the colours of plantings nearby pop against the brilliant white! Deutschland is essential for a complete astilbe bed. Peach Blossom: Everyone's favourite! Masses of salmon pink florets create spectacular plumes that add just the right touch of colour to your favourite flower garden. Gorgeous as individual specimens, but even more attractive in beds and drifts. The colour lasts for weeks and weeks.